Possible traces of life may lie just centimeters below the moon’s icy surface. Finding life on Jupiter’s icy moon Europa might not be as difficult as previously thought. 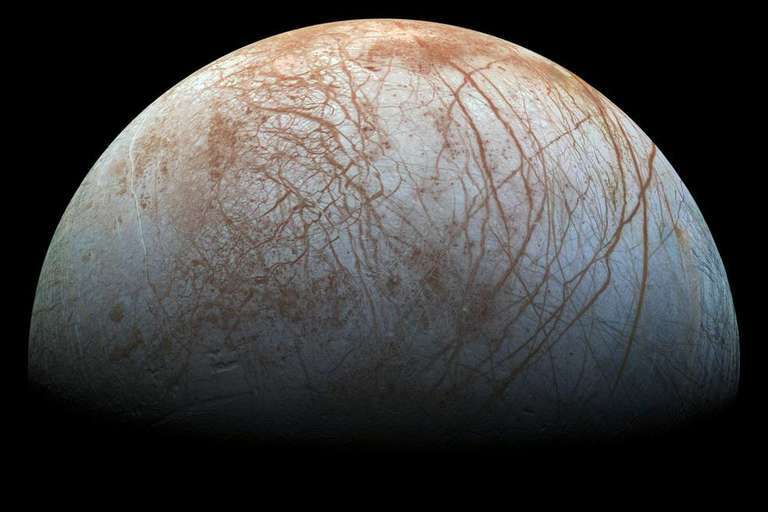 Europa has been one of the top contenders for extraterrestrial life, primarily because of its subsurface ocean. Approximately 100 kilometers deep, the ocean might be in contact with a rocky seafloor that is rich in the elements and energy needed for sustaining life. Getting a probe down to that ocean might be problematic, though, since Europa is encased in a dense, ice shell perhaps 25 km thick. Planetary scientists have bandied about concepts of complicated drills to get a submarine-like craft down to the ocean. But, according to new research published in the journal Nature, microbes or other traces of life on Europa might be found just below the icy surface even though the moon is blasted by radiation from Jupiter that can break down organic materials. “Even in the harshest radiation zones on Europa, our results show that it would be sufficient to simply ‘scratch the surface,’ i.e dig to 10-20 centimeters, to reach material that has not been heavily affected by radiation,” lead author Tom Nordheim from Caltech told Seeker. Nordheim and his colleagues modeled the effect of energetic particles impacting Europa’s surface and then calculated estimates from laboratory data on how quickly radiation destroys amino acids. They found that that at mid-to-high latitudes, Europa’s ice provides enough protection — acting as a shield against the radiation — that amino acids could persist at detectable levels just 1–3 cm below the surface, even over a 10-million-year time scale. At the more irradiated equatorial regions, however, the protected depth would increase to several tens of centimeters. The environment around Jupiter is intense with radiation, as charged particles are trapped in the giant planet’s magnetosphere and form powerful radiation belts. These belts are similar to Earth's Van Allen belts, but are many millions of times stronger. The new research shows that life could survive on Europa’s surface, but how might it have gotten there in the first place? While scientists have been pondering a subsurface ocean on Europa since NASA's twin Voyager probes flew by Jupiter in 1979, more recent research has shown that the ocean may actually shoot up to Europa’s surface. The icy moon is covered with cracks and fissures, and observations from the Hubble Space Telescope and the Galileo mission have shown that some of these cracks had separated. Dark, icy material appeared to have flowed into the opened gaps. In 2016, Hubble also found evidence of plums of water vapor being expelled from the ice surface of Europa. Kevin Hand from NASA’s Jet Propulsion Laboratory, who also participated in the research, has long been studying Europa. In a 2013 paper co-authored with planetary science Mike Brown, Hand concluded that the surface of Europa might “taste” a lot like ocean water here on Earth — infused with salts, such as magnesium sulfates. If there is a chemical exchange between the ocean and surface, it would make for a rich chemical environment. Another way that life-sustaining materials could have been introduced to Europa’s icy surface is through a process called meteoritic gardening, or impact gardening. “The basic idea is that on an airless world like Europa, or the moon, small meteor impacts mix and churn the surface, much like digging in a garden,” said Cynthia Phillips of NASA’s Jet Propulsion Laboratory, who was not involved with the recent research, but has been very active in studying Europa. Over time, Phillips said, a random distribution of small and large impacts take place, and varying amounts of different material gets mixed together. While impact gardening definitely takes place on Europa, she added, scientists don’t have a good measurement of impact frequency and so can’t say for certainty how deep the layer of surface material might be. Meteoritic impacts over a 10-million-year timescale would expose and mix materials from shallower depths that had been exposed to more intense irradiation with material from greater depths exposed to less irradiation, lessening the effect of the ice’s protection. 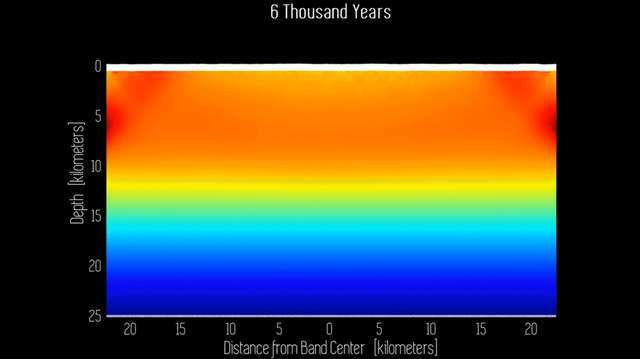 But the ice and minus 300 degree Fahrenheit temperatures at Europa’s surface provide a shield. Laboratory studies conducted by Nordheim and his colleagues found that amino acids contained within water ice at low temperatures display “substantially reduced destruction rates,” according to their paper. The only way to definitively find out about potential life on Europa, however, is to go there — and NASA has plans to do just that. The Europa Clipper mission is an orbiter tentatively set for launch in the early to mid-2020s. The spacecraft would conduct a series of flybys of Europa. With a suite of instruments, the mission aims to confirm the presence of the subsurface ocean, characterize its makeup, and study the processes of surface-ice-ocean exchange. And NASA is also studying concepts for a Europa lander mission, which would launch after Europa Clipper. Phillips said one concept submitted by her and a group of colleagues includes instruments like an organic chemistry analyzer, a vibrational spectrometer, a microscope, a camera, and a seismic analyzer.